On designed QB runs against Eastern, Denard was being stopped for little or no gain on more plays than I can ever remember happening in the past. Especially against EMU-level competition, the QB stretches and draws that became a staple of the offense in 2010 were being stopped behind or just beyond the line of scrimmage. One reason for this loss of effectiveness is move from a zone blocking scheme to a gap blocking scheme with pulling linemen. 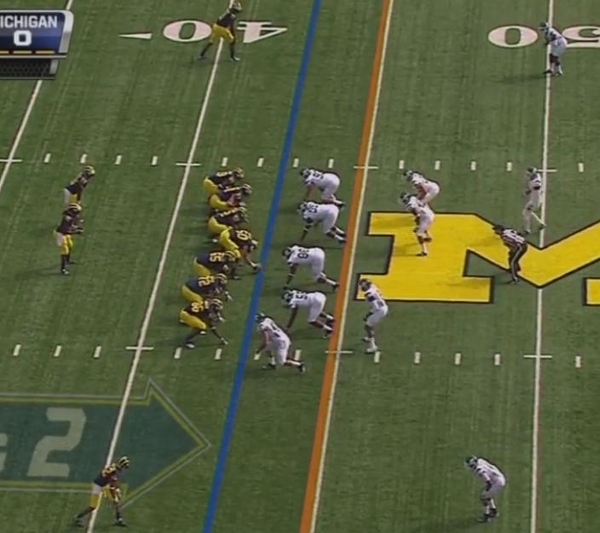 It's early in the first quarter and Michigan has a 1st and 10 on their first drive. The offense comes out in shotgun with two tight ends and two receivers. Toussaint is lined up to Denard's left. Eastern is in a 4-3 under front with both of their safeties in the box. As the ball is snapped, the offensive line starts blocking to the left line except David Molk and Taylor Lewan, whose first step is away from the line of scrimmage as they pull around the formation. A moment later, you can see Lewan and Molk pulling toward the playside as LG Ricky Barnum and playside TE Brandon Moore block the playside DT and DE respectively. Toussaint is headed outside the tackles as a lead blocker. Lewan and Molk are still running to pull beyond Moore and Barnum respectively. The EMU linebackers are flowing with the play. Denard is looking for a hole to run through but there aren't any. 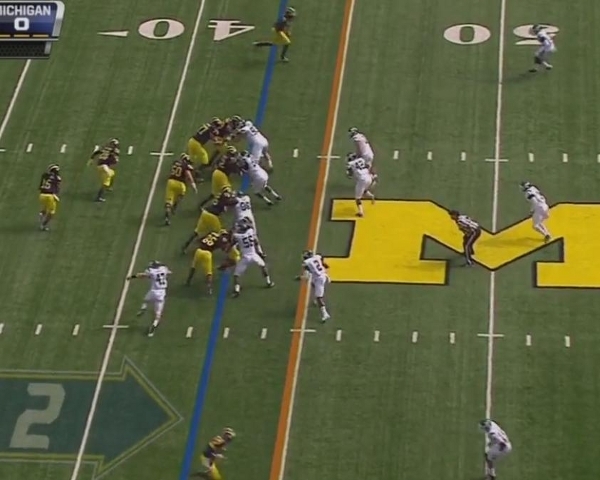 Molk and Lewan have now both pulled to their positions and are looking downfield to block EMU's two linebackers. Moore and Barnum are both holing their blocks. 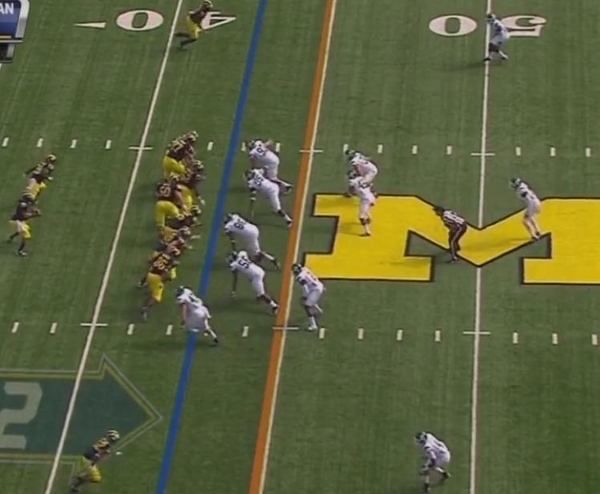 By the time Molk and Lewan engage the linebackers, EMU has stretched the play out to the sideline, causing Denard to cut back upfield into the pursuit defenders. He's tackled for a three yard gain. 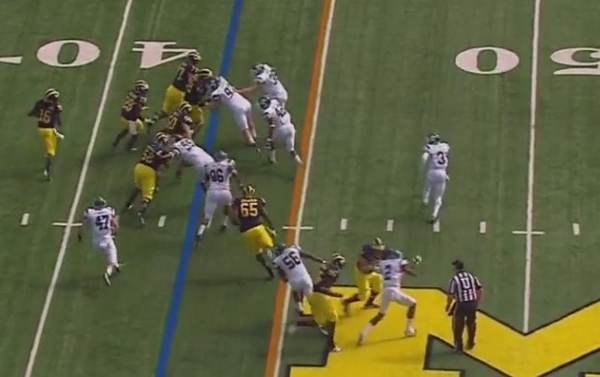 I don't understand why Michigan would run this blocking scheme instead of zone blocking the play. We already know that Molk is adept at reach blocking, so reaching and sealing defensive tackles will free Barnum to block EMU's linebackers. The same goes for Moore blocking on the edge; if Lewan and Moore double the playside defensive end and seal him to the outside quickly, Lewan will be able to release to the second level. However, with this pulling scheme, EMU stretches the play out to the boundary as Molk and Lewan attempt to pull into their gaps. This gives Eastern's pursuit defenders time to close off any cutback lanes. 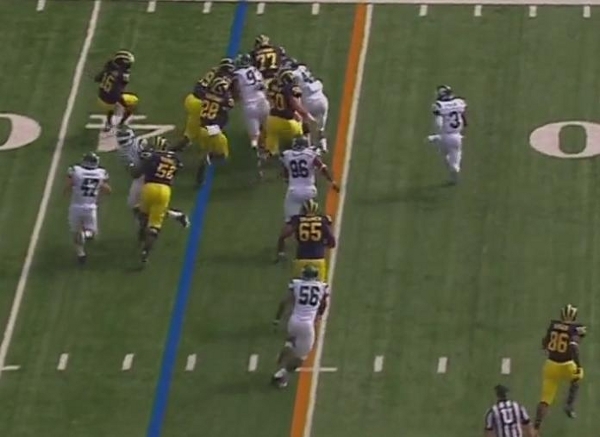 This is further evidence that Michigan should utilize zone blocking schemes more frequently. It also puts into stark contrast the offensive line's effectiveness zone blocking versus gap blocking. The threat of Denard's run is grounded in its explosiveness and a defense's inability to get into position. If Michigan extends runs like this, it allows opposing defenses to get into a position to close off Denard's running lanes. If the defensive line doesn't get blown off the line of scrimmage (which, if it didn't happen against EMU, it won't happen at all), this play is destined to be stretched out and stopped for little or no gain. Denard's running for 7.0 YPC this year and ran for 6.6 YPC last year. It's early in the year obviously (denard was probably averaging almost 8 last year at this time), but I don't think we can draw many conclusions from 1 ineffective run. The first play of the ND game was a 7 yard QB run. 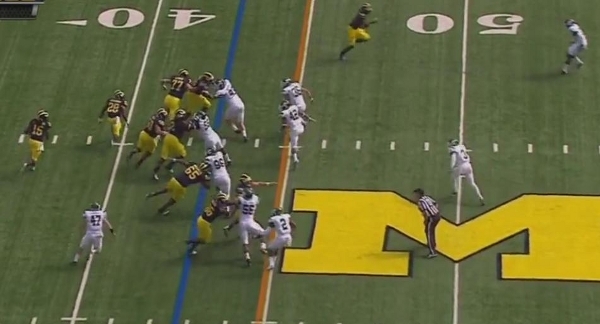 In this play, Denard should have just ran for the sideline and taken his 5 yard gain and first down w/o taking a hit. It's not that this one run is reason to scrap gap blocking or proof of an ineffectual scheme, but it adds to the growing evidence that this offensive line is much better at zone blocking. Well, it's a logical hypothesis - the system they've been running for the last 3 years (more for Molk and Huyge) has been zone blocks. So they should be better at it. But...is the effectiveness of the offense any less? - TBD. Effectiveness is a vague term. I was a big advocate of the 2010 offense, but I have to admit that it's ability to come from behind always worried me (ND games aside). I'm hoping that Borges hodge-podge of styles will get us toward something that's a little more consistent and reliable by the end of the season, and I'll sacrifice some explosiveness if that's what it takes.